Include: All Scheduled Servicing with Alignment, Balancing be performed every 10,000 Kms. Does not include Wear & Tear Items or other Service related expense. Rs. 495 (Alignment) + Rs 500 (Balancing) + Rs 195 (Tyre Rotation). 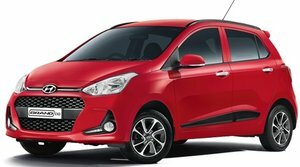 Grand i10 asta 18000 km 36 month service cost ? Please let me know service cost for grand i10 spotz petrol @ 68000 KM's. Hi sir, Please let me know service cost for grand i10 spotz petrol @ 68000 KM's. Friends, my Grand i10 of 1 Years 4 months only ONLY brake down on Road due to Clutch Plate burnt as per Hyundai Technician. I was with Family in chilled evening on road and face big issue due to this. Hyundai sent tow service after 1 & half hour. Hyundai Service center asking around 10 thousand from pocket and saying its not covered under warranty. What tyo do?. Can I claim in Insurance or Warranty? It gave me big headache in winter on road with family and kids. Earlier I drove Toyota Corolla around 6 Years and never face this kind of issue on road. I am hugelly disappointed with Hyundai parts. Its looks like a Chinese made products. Even I faced same suitation long back with my i10 in 2012. Car was just an year old and clutchplate broke down during driving all of a sudden in highway. Clutchplate wear and tear is not covered under insurance. Need to she'll money out of pocket for repair. Hyundai cars gearbox and clutch is very sensitive compared to other cars. Even I faced same suitation long back with my i10 in 2012. Car was just an year old and clutchplate broke down during driving all of a sudden in highway. Clutchplate wear and tear is not covered under insurance. Need to she'll money out of pocket for repair. Hyundai cars gearbox and clutch is very sensitive compared to other cars. Hi - I am from Bangalore. I left my Hyundai Grandi 10 CRDI 2014 Model for service. They informed the Clutch Plate Assembly might be replaced. My Car has drive around 53000 KM, does it require to change the Clutch Plate Assembly. Any Suggestions ? Hi, I recently went for i10 grand (Petrol) third free service to a Modi Hyundai service center. They charged me 8500/- + taxes. break up wheel balancing 1600/-. air Filters 900/-, A/C service is usually done in 4th service, but still charged in 3rd for 2200/-, oil 3800/-, are these costs legit. is Modi Hyundai overcharging. And carry your cars owners manual with you and check what all things needs to be replaced, top up or cleaned this way Service centre guy will not try to fool you with extra unwanted expenses and he will come to know "Purana khiladi hai"
Thats a lot of money... I did my third service few months back they charged me around 2600-3000... I don't remember exact figure... Actually first thing you have to ask these guys for estimate and details of jobs to be carried out in this service... And carry your cars owners manual with you and check what all things needs to be replaced, top up or cleaned this way Service centre guy will not try to fool you with extra unwanted expenses and he will come to know "Purana khiladi hai"
What is the avg Paid service cost for Grand I10 Diesel. for 90000 km where they replace Diesel, Air, and Oil Filter. I see the Service cost is always around 9000+ for every 10000 km since the time I started my paid service. Is this reasonable or Am I paying high? Hi, am from kerala yesterday my carbroke down due to clutch failure, its only 7000kms in 1.2 years. The service center is denying clutch warranty and asking for 15000rs excluding labour charge. Have any idea about this please help me i strongly believe its manufacturing fault . Hi, am from kerala yesterday my carbroke down due to clutch failure, its only 7000kms in 1.2 years. The service center is denying clutch warranty and asking for 15000rs excluding labour charge. Have any idea about this please help me i strongly believe its manufacturing fault . Clutch plates r not in warranty in any car manufacturer. Hello for i10 Grand Diesel - AC gas quantity ?